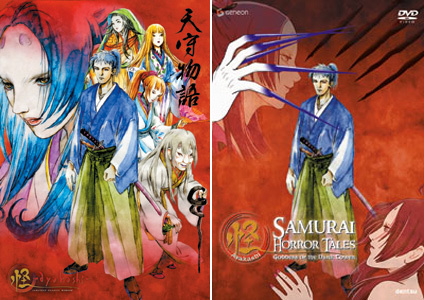 Toei Animation’s unique series of classic Japanese horror tales has been brought to America as Ayakashi: Samurai Horror Tales. Our first tale brings Izumi Kyoka’s play, Tenshu Monogatari, to life as we follow a young falconer named Zushonosuke Himekawa and his dream-like encounter with Princess Tomihime while searching for a falcon under his care. Zushonosuke can’t erase the woman from his mind, but he is about to step into a world unlike any he has ever known. Princess Tomihime and her servants are “forgotten gods,” and the rules dictate that those who have seen them must perish. 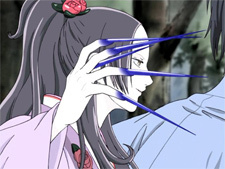 Geneon Entertainment brings the first of three classic Japanese stories to the Western world with Ayakashi: Samurai Horror Tales – Goddess of the Dark Tower. 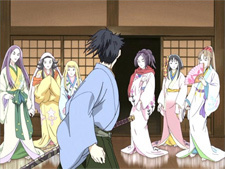 Ayakashi breaks the normal boundaries of a TV series by creating a unique animation style for each individual tale that further separates each of the unrelated tales. The story of Tenshu Monogatari is broken into four episodes (acts) that combine to complete the original story by Izumi Kyoka. Because of this unusual format for a television series, I will be reviewing each volume of Ayakashi as if it were a stand-alone film to preserve some of the mystery and spoilers of the later acts. A band of thieves congratulates themselves on successfully robbing a couple’s wedding ceremony. Needing shelter for the night, they decide to take refuge at the abandoned Shirasagi castle. An old hag, Shita-Naga-Uba, steps from the shadows warning the travelers that Castle Shirasagi belongs to forgotten gods. However, the thieves aren’t afraid of the idea of evil spirits and venture into the dilapidated castle anyway. As they begin to party that evening, the forgotten gods reveal themselves. Each spirit living within the castle is a beautiful woman, and they want to join the fun. Unfortunately for the thieves, the fun for a forgotten god is killing each of the trespassers. The local Lord takes a hunting party out to find some game. Zushonosuke brings his falcon, Kojiro, to flush out rabbits for the Lord to shoot. The hunting is going well until a rainstorm approaches. At the same time, a wild boar comes out of hiding and the Lord wants to kill it before it gets away. He orders the falcon released to round up the boar, but Zushonosuke is hesitant with the heavy storm pouring over them. The Lord demands the falcon be sent and Zushonosuke begrudgingly complies. Kojiro circles above while the boar manages to get away. The Lord, in a fit of anger, takes a shot at Kojiro and scares the poor falcon into the woods. Even more enraged by the bird’s actions, the Lord sends his men to retrieve the bird. 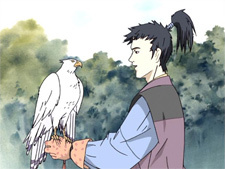 Kojiro is to be a present for the Shogun and they can’t let the bird get away. While searching the woods, Zushonosuke comes across an expensive kimono hanging from a tree branch near a pond. While pondering the kimono’s origins, a beautiful woman steps out of the water and approaches him. Embarrassed for having intruded on the woman’s bath, Zushonosuke turns around and apologizes for his mistake. She silently smiles but does nothing except put on her clothes. Zushonosuke explains that he is looking for a falcon and then graciously exits to continue his search for the bird. From behind the tree comes one of the woman’s attendants and asks why the princess would speak to a human instead of hiding or even simply killing him for seeing her. The princess replies that they did not exchange words and then ponders why she really didn’t think to kill the poor man where he stood. 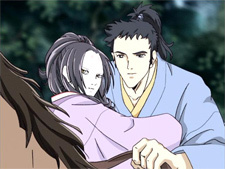 Zushonosuke goes out to look for Kojiro near the abandoned castle when he happens to meet the mysterious woman again. At first the princess tries to force herself to kill Zushonosuke, but she can’t bring herself to do it. The princess Tomihime decides to speak to the falconer and explain the origin of forgotten gods. The tale explains how the humans and gods once co-existed, but trouble soon followed. And even worse, the only way for the gods to sustain themselves is to eat humans. Just then two rogue-demon treasure-hunters show up and challenge the princess. Zushonosuke defends her honor, but she is wounded in the battle. As Tomihime leaves somewhat injured from a stray blade, the two demons return once again to explain that the helpless princess he’s been talking to is a forgotten god. Zushonosuke goes to see his Lord and is ordered to bring back Kojiro at all costs. As he leaves, Zushonosuke’s girlfriend, Oshizu, spots him carrying a sword given to him by the Lord. She’s happy to see Zushonosuke finally recognized as a skilled swordsman, until he reveals that he’s expected to commit seppuku if Kojiro is not brought back. As Zushonosuke approaches the castle, our two treasure hunting demons await him at the entrance. They are not going to let a human try to do this alone, but Zushonosuke makes it clear that they are not to be considered friends. Inside the castle the trio are soon surrounded by the forgotten gods. Knowing Zushonosuke has no chance, they knock him out of the room so he can find Kojiro. 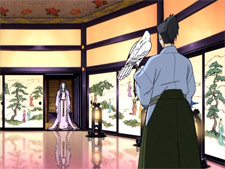 Wandering through the hallways, Zushonosuke comes across a beautiful room with Kojiro safely inside. He is relieved to see his friend again, but this is short lived as Tomihime walks into the room. Kojiro flies back to the princess as Zushonosuke realizes that everything he has been told about her is true. As quickly as they break into Castle Shirasagi, the trio are captured by the forgotten gods. Uba questions Tomihime’s odd behavior with the wandering falconer. Could Tomihime be breaking the rule of falling in love with a human? Tomihime blows off the answer and leaves the room. Held prisoner in the dungeon, the men fear what fate will befall them when Tomihime comes to release them. However, Zushonosuke will not leave without the falcon and Tomihime will not give up the falcon she believes was originally hers. Tomihime takes Zushonosuke to the top of the castle to watch Kojiro fly free and explain her situation. Years ago, Tomihime’s mother fell in love with a human who wandered into their territory. He, in turn, used her powers to conquer the region’s domains and ultimately left her when this was finished. Still in human form, Tomihime’s mother passed away and the soul turned into the falcon Zushonosuke calls Kojiro. And now Tomihime is facing the same problem as her mother once did: she has fallen for Zushonosuke. Ayakashi: Samurai Horror Tales’ Tenshu Monogatari is a beautiful story about forbidden love between a falconer and the princess of the forgotten gods. The character designs and well-orchestrated period-music draw you into the story with ease in this four-episode tale. The story enjoys switching between love, betrayal, and jealousy as Zushonosuke grows more distant from the love of Oshizu. The Japanese cast compliments the play with some good interactions between Hoko Kuwashima (Princess Tomihime) and Hikaru Midorikawa (Zushonosuke Himekawa) as they slowly fall in love. Ako Mayama (Shita-Naga-Uba) is equally powerful as the old woman who tries to keep the lovers apart, the house in-line, and the trespassers out. It’s not easy to play three roles at the same time, but Ako Mayama does a good job. The English production by The Ocean Group’s in-house Vancouver studio, with strong direction from Keith A. Goddard and writing from Kathleen Westlake, makes Ayakashi an accurate and enjoyable experience. Kirby Morrow’s Zushonosuke and Willow Johnson’s Tomihime work well as forbidden lovers, but it is even more noticable when you add the element of newcomer Tracey Power‘s Oshizu as the jealous lover who Zushonosuke has left behind. It’s worth making an effort to check out the English dub when you have some time. Ayakashi: Samurai Horror Tales – Goddess of the Dark Tower is a great opening story and something that should bring a wide variety of fans to the series. The opening theme, HEAT ISLAND, is an addictive Japanese hip-hop number by Rhymester and fits well with the opening animation to the series. The video is a colorful, clean work with a matching pair of flawless subtitle tracks. Extras on the DVD include a textless opening and multiple pages of glossary information on some of the words used in the tale of Tenshu Monogatari. The DVD cover mixes the original Japanese sketch work cover with character animation and doesn’t come off as smoothly as one would hope. However, this is the only problem with the DVD and it’s a very minor issue. Ayakashi: Samurai Horror Tales – Goddess of the Dark Tower will catch your eye, expand your mind, and take you back to the days of the Samurai all in one sitting. It’s not to be missed.